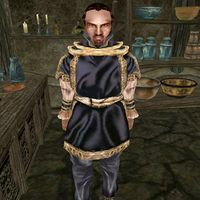 Clagius Clanler is an Imperial trader who has a shop in Balmora, where he buys and sells a wide variety of (mostly useless) goods. He wears an extravagant shirt with matching pants and shoes. Aside from his natural charm and ability to absorb fatigue from others, he knows no spells. This page was last modified on 29 March 2017, at 18:58.